Become a twitter follower and get a chance to win a $50 gift card to RedBubble.com! One (1) $50 Red Bubble Gift Card. My brother and I are excited about our latest contest. The awesome RedBubble.com is a community for artists to produce unique products from cards to t-shirts, stickers, framed prints, calendars, canvases, posters and other high quality products. They've kindly donated a $50 gift code to give away to our readers. Aren't they cool? Last month's contest was fun, but this month we're going to keep it simple. Just become one of our twitter followers. That's it. On our twitter feed @thegeektwins we regularly share interesting and fun articles from the web, plus early announcements and exclusive news. Now you can get all that and a chance at a $50 gift card! As a bonus, everyone that retweets about the contest gets an additional entry! We'll use the hashtag #geektwinsredbubble to track the entries, so make sure you use that. We have to have rules, of course, and here they are. No restrictions on locations. Redbubble delivers worldwide including APO, FPO, DPO addresses (Defence force, Diplomatic post etc). Age restrictions: 18+. Kids get your parent's permission. Must have a valid twitter account and email address. These are used for entry and delivery of the prize. If you've never been to RedBubble.com I'm going to share some cool designs from the site. 1. "Jedi in the Streets. Sith in the Sheets"
2. "Han Shot First" There are lots of these around, but this is one of the best. 3. 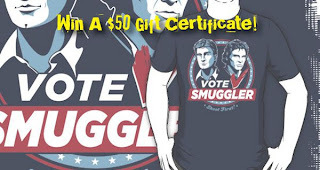 "Vote Smuggler. Shoot First!" Captain Mal from Firefly and Han Solo together at last. So, that's it! Become a twitter follower and enter for a chance to win $50 worth of cool gear from RedBubble.com! Do you want to win a $50 gift certificate? Are you one of our Twitter followers? Very cool! Followed you on Twitter. Thanks for the follow Flyergal! Maurice, that "Vote Smuggler" shirt is sweet. I love it. Thanks Colin and thanks for the reweet. It's my favorite of many great shirts. If I already follow, am I auto in, or do I have to RT? Which I will do any way. If you're a follower Tom, then you're in! We'll be taking the list of followers and randomly choosing a winner. Retweeting gets you an extra entry. very cool and very geeky prize! love it!